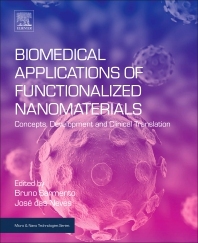 Biomedical Applications of Functionalized Nanomaterials: Concepts, Development and Clinical Translation presents a concise overview of the most promising nanomaterials functionalized with ligands for biomedical applications. The first section focuses on current strategies for identifying biological targets and screening of ligand to optimize anchoring to nanomaterials, providing the foundation for the remaining parts. Section Two covers specific applications of functionalized nanomaterials in therapy and diagnostics, highlighting current practice and addressing major challenges, in particular, case studies of successfully developed and marketed functionalized nanomaterials. The final section focuses on regulatory issues and clinical translation, providing a legal framework for their use in biomedicine. This book is an important reference source for worldwide drug and medical devices policymakers, biomaterials scientists and regulatory bodies. Bruno Sarmento is an Affiliated Investigator at the INEB–Instituto de Engenharia Biomédica, based at the University of Porto, Portugal and is Assistant Professor of Pharmaceutical Technology in the Department of Pharmaceutical Sciences, at ISCS-N, Gandra, Portugal. His current research is focused on the study of nanomedicines and their application in the pharmaceutical and biomedical fields, as well as the use of in vitro cell models as a tool to correlate the transport of biopharmaceuticals and nanoparticles across human mucosa. Bruno has been involved with more than two hundred publications, including three edited books in the field of Pharmaceutical Technology and Nanomedicine, more than one hundred papers in international peer-review journals and several conference proceedings. He also serves as an editorial board member for several international journals and an evaluator of research projects form international agencies. He is an active member of several international associations (AAPS, CRS, EUFEPS, EFSD, FIP) and works on biotechnology and health post-graduate programs at national and international level. José das Neves is a Post-Doctoral Researcher at INEB, the Instituto de Engenharia Biomédica, Porto, Portugal. His research interests focuses on vaginal drug delivery, nanotechnology-based drug carriers and biomaterials. He has previously written 7 book chapters and is the co-editor of three books.